Pictures & images of the Georgian Eastern Orthodox Samtavro Transfiguration Church and Nunnery of St. Nino in Mtskheta, Georgia. A UNESCO World Heritage Site. The small domed church of the Samtavro Monastery was originally built in the 4th century and has since been subject to various restorations. 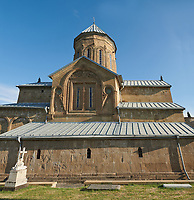 The main church of the monastery was built in the early 11th century. It contains the grave of Mirian III, the king of Iberia who established Christianity as official religion in Georgia. The first Christian monarchs, King Mirian and Queen Nana are buried here. 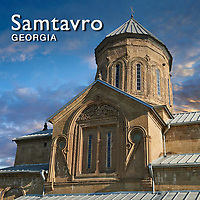 The Samtavro Orthodox Transfiguration Church was built in the 1030-1040s in classic Georgian architectural style with straight sided cupola topped by a simple sloping roof. The exterior has many fine geometric bas relief sculptures. Eastwards of the Church there is a small early medieval church of St. Nino. 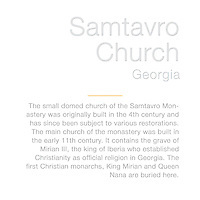 The historic church of Samtavro Monastery, are outstanding examples of Georgian medieval ecclesiastical architecture in the Caucasus region, and represent different phases of the development of this building typology, ranging from the 4th to the 18th centuries.